Denver Nuggets draft pick Erick Green – the 46th overall choice in June's NBA draft and the Atlantic Coast Conference player of the year from Virginia Tech – has agreed to a one-year contract with Euroleague power Siena of Italy, sources told Yahoo! Sports. The Denver Nuggets traded for Green's rights on draft night and plan to stay connected with Siena coach Marco Crespi regarding the guard's development next season. 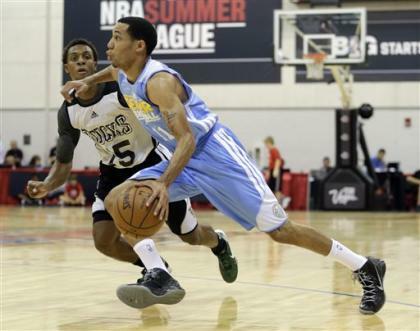 Denver has a full roster of contracts and had been limited on flexibility to sign Green for the 2013-14 season. Siena has a strong recent history of success with guards, including Bobby Brown and Bo McCalebb. Siena has won seven consecutive Italian League championships. Green was considered one of the best shooters in the draft, leading the ACC in scoring at 25 points per game on 17.2 shots per game.